Q: Where the heck is Misool? A: We are located on our own private island in Southern Raja Ampat, West Papua (formerly Irian Jaya), Indonesia, on the site of a former shark- nning camp. Our island is just south of the equator, S 02.244661, E 130.558167. 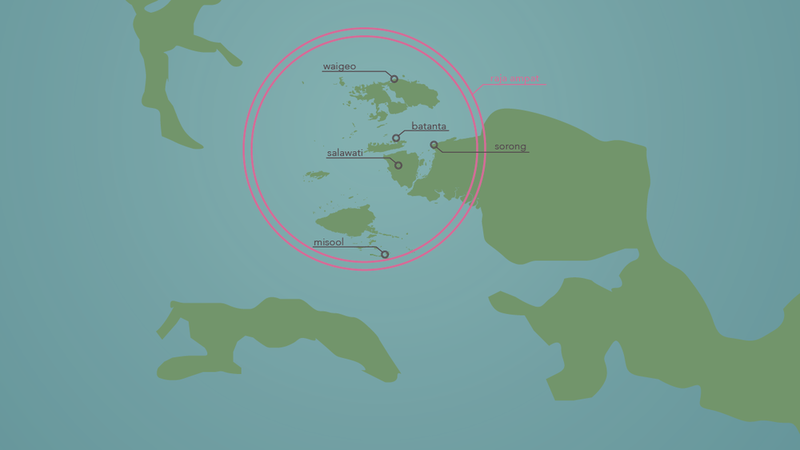 We are surrounded by our own 300,000 acre Misool Private Marine Reserve. All of our dive sites are within our own patrolled No-Take Zone. Q: How do I get to Misool? A: We will meet you at the Sorong Airport and then bring you to our cafe across the street. We'll treat you to a light breakfast and a cup of coffee while we load your baggage onto the speedboat. This is also a good time to change into shorts and a t-shirt, so keep those handy in your carry-on baggage. When the boat is ready, we'll take you the harbour, with departure around 09:00. We recommend all guests transit through Jakarta, arriving the evening before the start of your stay at Misool. From Jakarta, plan to y with Garuda Indonesia Airlines, departing Jakarta at 00:20 with GA682. You'll arrive in Sorong at 06:35 on the rst day of your stay at Misool. Transit through Bali is also possible, though the flights are less convenient. Of course you may make alternate arrangements, but our transfer boat will only wait for GA682. In the unfortunate event that you are booked in a different flight which is cancelled or delayed past 09:00, we will have to make alternate arrangements to get you to the island, at at your own expense. NB: We do not recommend Express Air or Nam Air. Q: What is the baggage allowance? A: Baggage allowance for Garuda domestic travel is 20 kg, and excess baggage fees around 40,000 IDR/kg. Please note that if the international ights are on a SkyTeam Alliance airline such as Delta, KLM, Air France, Korean Air, or Garuda, you maybe able to check your baggage all the way through to Sorong. In this case, Garuda currently gives 30 kg for domestic flights as well. Q: Yikes, this sounds complicated. How do I book my domestic flights? A: Don't worry, we're here to help. We will happily book your internal flights for you, as well as hotel bookings in Sorong. Q: What sort of boat will we travel on to reach the island? A: We'll travel on our own private vessel, Merantau. Built in 2018, she’s she's purpose-built for cruising Raja Ampat's waters. She's a comfortable 20 meters long, equipped with 6 x 250hp engines, air conditioned, fitted with comfortable seating both inside and out, galley for hot and cold drinks and snacks, and a washroom. Merantau is fully equipped with safety and navigation equipment. Click here to see photos and video of Merantau. Q: How long does it take to reach the resort island? A: The transfer from Sorong to Batbitim, our resort island, is about 4 hours, depending upon sea conditions. The first third is a scenic passage between the Papuan mainland and small islands of the Salawati group, fringed by mangroves. The second third of the journey is an open crossing over generally calm seas. During the final leg of the journey, we enter the breathtakingly beautiful island chain to which Batbitim belongs. We'll cruise between sheer karst cliffs and innumerable small islands, often escorted by dolphins. About 30 minutes before we arrive at the resort, we'll cross the border of our Misool Private Marine Reserve. Q: How much does the speedboat transfer cost? A: The transfer costs $335 in 2019. Of course if you are arriving/departing by liveaboard or private vessel this fee will be adjusted or waived. Q: What if I have to spend the night in Sorong before the trip? A: We can arrange a Sorong Arrival Package for you. We will collect you at the airport, take you to your hotel and check you in. We'll collect you again the following afternoon and bring to to the dock for a 09:00 departure. Q: When can I visit? A: Misool offers all-inclusive packages for 7+1, 9+1, or 12+1 night stays. That means 7 nights at the resort followed by 1 night in Sorong on scheduled departure dates. Consider combining 2 consecutive trips to receive a 10% discount on the shorter stay. View our schedule here. Q: What's included in the accommodation package price? Package price includes accommodation, meals and snacks, drinking water, soft drinks, coffee and tea, and one hotel night with breakfast in Sorong following your stay at Misool. Airport pick-up and drop-off service in Sorong, porter fees, transport between the airport and the harbour on scheduled transfer days. Packages quoted per person based on double occupancy. Learn more about our rates here. PS - as of January 2019, Misool donates 100 USD per person to our sister charity, Misool Foundation. We invite you to match our donation. Q: What's included in the dive package price? A: Tanks, weights, expert guides, fuel, free Nitrox for qualified divers upon availability. The first 'Check Dive' is counted as part of your package, as are all other House Reef and boat dives. Government tax and service charge are included in the package price. Q: What's not included in either of those packages? Speedboat transfer from Sorong to our resort island. The cost is 335 USD per return trip on scheduled departure dates in 2019. Equipment rental. To avoid disappointment, please advise us well in advance if you require any rentals. We recommend that you bring your own mask, snorkel and fins to ensure comfort and fit, but we do have a small selection for hire which must be reserved in advance to ensure availability. We don’t rent wetsuits, so please bring your own with you. Each guest (whether diving or not) must purchase a Raja Ampat Marine Park Entry permit. This is available for 1,000,000 IDR (about 73 USD), or 500,000 IDR for Indonesian nationals. The tag is valid for one calendar year. We'll arrange this for you if you need it. Most other experiences, like visits to the petroglyphs, kayaking tours, private beach picnics, etc. Some are free of charge for guests booking unlimited dive packages. Spa services. You can learn more here. Alcoholic beverages. We have Indonesian beer and imported wine and champagne available for purchase. Dinner in Sorong following your stay with us. Breakfast is included at the hotel. Internet usage. Our satellite connection provides us with very limited bandwidth. You may connect to the internet with our computer in the Dive Centre at a rate of 0.37 USD per minute. Or you may purchase unlimited usage on your own device for 55 USD/7 nights, 72 USD/9 nights, and 85 USD/12 nights. The first 10 minutes are free so you can test the speed for yourself. Q: What sort of payment do you accept for incidentals incurred during my stay? A: Incidental charges such as spa services, excursions, internet, souvenirs, etc can be paid by Visa, Mastercard, or cash (Rupiah, USD, or Euros) before your departure. Our bank will charge you 2% for this service. If you'd like to pay in cash, please note that foreign notes must be in perfect condition - otherwise Indonesian banks will not accept them for exchange or may choose to give you a lower exchange rate. USD 100 notes receive the best exchange rate if dated 2000 or later. Proof of dive insurance and dive certification card. We'll need to see them before you get in the water. All dive equipment, including a torch, surface marker buoy, dive computer, wetsuit, and well-maintained gear. Computer and surface marker buoy (safety sausage) are required safety equipment. If you need to hire any equipment, please let us know well in advance. Please note that we don’t rent wetsuits so please bring yours with you. We also recommend you bring your own mask, fins, and snorkel to ensure proper fit. Passport valid from 6 months from the time of entry into Indonesia. Nationals of most countries will be granted a 30-day Visa on Arrival, which is free of charge. 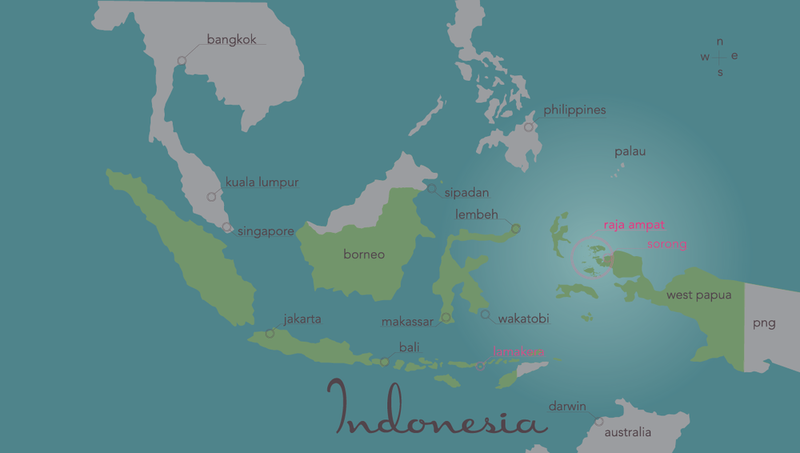 We recommend you check with the Indonesian Embassy in your home country to confirm. One full empty page in your passport in which to put the Visa on Arrival sticker. You may be asked by Indonesian Immigration officials to show a copy of your airline ticket out of Indonesia within the 30-day period. A warm pullover or jacket. Evenings can occasionally be brisk, and the domestic flights are often freezing. Light coloured clothing. For some reason, light colours are generally less appealing to mosquitos than dark ones. Any toiletries you may need such as razors, tampons, toothpaste, medications, etc. We supply eco-friendly shampoo, conditioner, and soap, so you don't need to bring those. A postcard from your hometown for our staff bulletin board. Our staff are thrilled to know guests come from far and wide to visit their home. Some very basic English books to add to our staff library. We have a library for our staff, we sponsor two local primary school libraries, and we've just finished construction on a local kindergarten. Q: What should I not bring with me? Please plan carefully to minimise your rubbish. Whenever possible, choose rechargeable batteries and avoid bringing things like disposable razors, excessive plastic bags, plastic water bottles, etc. Any non-biodegradable and non-recyclable rubbish will have to be returned to Sorong. We are operating in a pristine environment, and we'd like to keep it that way. Anti-bacterial soap. Our waste water treatment system relies on plant life to remove nitrogen, phosphates, and bacteria from grey and black water. Using harsh detergents and bactericidal agents will harm our plants, reducing the efficacy of our filtration system. Please don't use them. Dive gloves. You will not be permitted to wear them. Fishing/spearfishing equipment. All fishing is strictly forbidden. Q: What sort of power do you have? A: 220 volts, 24 hours a day. We also have some 110 V transformers available in the Dive Centre. Oh, and by the way, about 60% of our power comes from our photovoltaic array. Q: What about airport departure tax? A: At the time of writing, departure tax is included in the ticket price for both domestic and international flights. Q: When is the best time of year for diving? A: The weather is rough in July, August and early September. That's when we close for maintenance. Aside from this yearly occurrence, diving in Raja Ampat is not particularly seasonal. September and October bring massive schools of bait fish, which attract bigger hunting fish and Mobula rays. The south winds in May and June bring more sharks and pelagics. Visibility tends to be at its best in November and February/March. Q: How many dives can I do per day? A: There are three scheduled boat dives per day, as well as either a dusk dive or a night dive each night. The House Reef is open from 08:00 to 20:00 every day for buddy teams or guided dives. Q: How big will my dive group be? A: Maximum is 6 divers per guide, but 4 is more likely. Please let us know in advance if you'd like to engage the services of a private guide. Q: What about child divers? A: We can accommodate child divers upwards of age 10 (but we've had snorkellers as young as 2). Please enquire about depth restrictions, equipment, and private guiding. Q: Can I do deco diving? A: No. Because of our remote location we dive very conservatively. We do not allow deco diving, and the maximum depth is 30 metres. We do not allow solo diving. A: Yes, provided free of charge to qualified divers, upon availability. Q: What can I do at Misool if I don't dive? A: Lots of stuff! It's lovely to lounge around in a hammock with a good book, enjoying the balmy tropical breezes, watching the baby sharks passing by in the lagoon and the colour of the water change over the course of the day. Sample some of our extensive spa services, or join our chef for a cooking class. If you're looking for more active pursuits, we highly recommend snorkeling on the House Reef, where you can spot turtles, sharks, and an endless parade of colourful reef fish. You might also enjoy taking one of our kayaks or Stand Up Paddle Boards for a spin or join one of our other non-diving adventures. Q: What sort of food can I expect at the resort? A: Meals are served our beach-front Restaurant. We offer a tasty, nutritious, and whenever possible, organic menu with an emphasis on fresh local food. Breakfast and lunch are served buffet-style. We offer a mini-breakfast before the first dive, a giant cooked breakfast after the first dive. Lunch is served family-style. Afternoon teatime features homemade treats and savoury snacks. Dinner service is plated, so your meal is always prepared fresh even if you're planning a night dive. We also have an all-day a la carte menu available. We do not recommend undertaking a diet during your stay with us. Out of respect for our Muslim hosts, we do not serve pork products. All our fish is locally sourced, line-caught blue water fish. We do not serve reef fish or long-lined fish. We also do not serve prawns due to similar concerns about sustainability. We can easily accommodation vegetarians and vegans. Please let us know about any other dietary restrictions or allergies well in advance of your arrival. Clean drinking water, Papuan coffee, tea, and soft drinks are provided free of charge. Beer, imported wine, and imported sparkling wine are available as well. Q: What sort of service can I expect? A: As part of our commitment to conservation and building the local community, we employ as many local people as possible. Many of waiters and housekeepers you'll meet have been with us from the very start, when they worked as labourers, carpenters, dishwashers, and roofers. These staff members of course learned English and service skills along the way. But even more importantly, they all possess a certain quality which is impossible to teach: the art of warm and authentic hospitality. So while our service is not white-glove standard, it is attentive, friendly, and absolutely genuine. And it's a wonderful opportunity for our guests to get to know the locals. Q: What if I get sick or hurt while I'm there? A: We are a long way from the nearest doctor, hospital, or recompression chamber. Your health and safety are of paramount importance, so we advise all guests to take utmost care. Several of our staff are certified PADI Emergency First Aid Responders. Oxygen is available. In the event of a general medical emergency, you will be evacuated to the nearest hospital, which is in Sorong. In the event of a diving emergency, your diving insurance provider will advise us on the appropriate course of action. You must have dive insurance if you plan on diving. We recommend DAN or PADI insurance, which covers emergency evacuation. You can read more about them here. We also strongly recommend health and travel insurance. Q: Should I take precautions against malaria? A: We recommend that you always sleep under a mosquito net, wear light-coloured clothing, cover up during evening and early morning hours, and use an insect repellent if necessary (we have natural and very effective mosquito repellent available on site). As for malarial prophylactics, we suggest you consult with your doctor or look here for more information. Q: How can I stay in touch with my family and friends while I'm at Misool? A: Enjoy the luxury of some screen-free time while at Misool. Prepare to turn off your mobile phone, as we are well out of range. We do have a satellite internet connection available in the Dive Centre, but it’s frustratingly slow. Consider taking a break from your email and just relaxing instead. If your friends and family need to contact you, we encourage them to write to guest(at)misoolecoresort.com. We’ll pass the message on to you via Island Post. A: Misool is deeply committed to a policy of environmental and social responsibility. We seek to provide exceptional and enriching experiences in a sustainable environment, for both staff and guests alike. We aim to protect and revitalize both our natural surroundings and the community in which we operate. We are committed to demonstrating to our hosts, our guests, and the local government that tourism can support a local economy with much more favourable terms than mining, logging, overfishing, or shark finning. We'd love to sit down with with you over a cup of coffee and share more, but in the meantime you can read more about our mission here. Or visit our sister organization Misool Foundation.